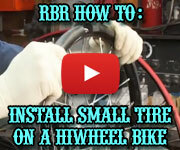 Welcome to Rideable Bicycle Replicas, builder and supplier of custom Hiwheel bicycles. If you're looking for something different and unique, you've come to the right place. 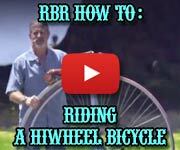 RBR can supply you with anything from the classic hiwheels—those spoked behemoths from a bygone era—to one-of-a-kind custom bikes. 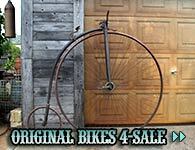 We feature a full line of antique replica bikes, and offer original antique bikes when available. Be sure to check out our top-of-the-line Superior hiwheel bicycles. To ride one of our antique-style bicycles is like taking a trip back to another era—to a time when things were slower, but a lot more pleasant. You can see even more varieties of bikes, plus parts & accessories, using the navigation area at left. Be sure to check out our "Superior Hiwheel", and our "Hiwheel Trike". 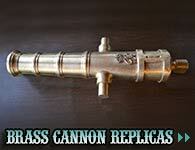 You can also see a collection of customer images on the Customer Photos pages. 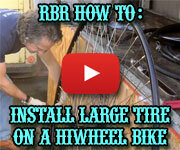 Below is a video of Greg Barron demonstrating the finer points of riding a Hiwheel bicycle. For more Hiwheels in motion, visit our Videos page. now available! 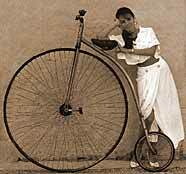 Antique original Hiwheel bicycles for sale! When you're ready to place an order, or if you have any questions, please call us at 510-769-0980, or send us an email. Rideable Bicycle Replicas was featured on the February 11, 2010 episode of the CBS 5 magazine show "Eye on the Bay". In 2008, Rideable Bicycle Replicas received the "Best of Alameda" award. See more on our "In the Press" page. Please Note: Nickel and copper custom plating is now available, in addition to custom color powdercoating. 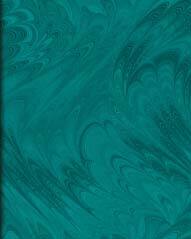 All prices shown on this web site are suggested retail and subject to change without notice. Every effort is made to keep these prices current, but changes do occur. 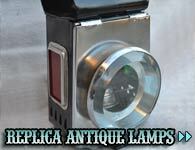 Please contact us for final price.